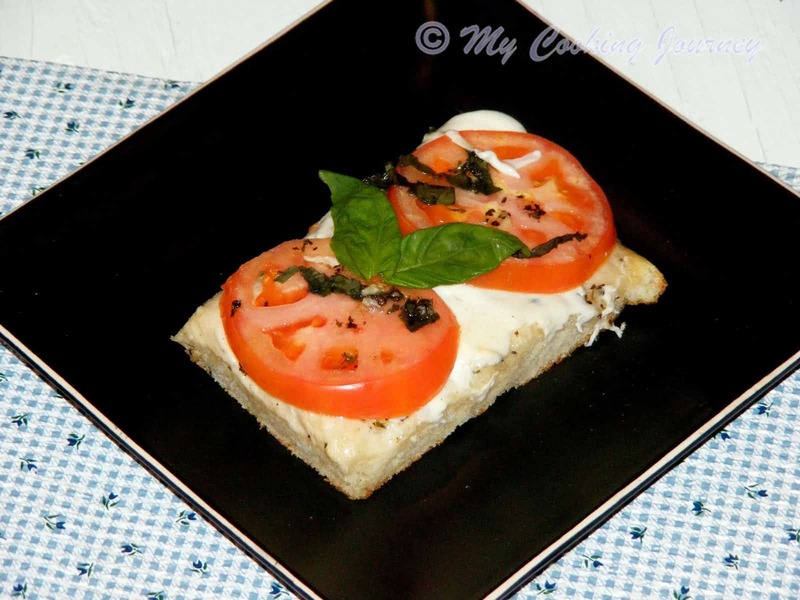 This month’s baking partner’s challenge was to make a thin crust pizza. 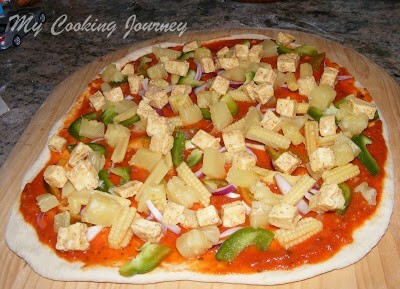 My whole family being big fans of Pizza, this was something I really looked forward to making. There were three recipes and we were to follow one of them. 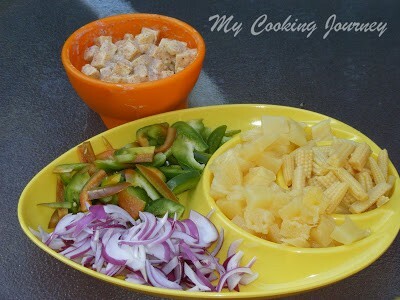 I used the recipe suggested by Archana of Tangy Minds. The recipe is adapted from serious eats. 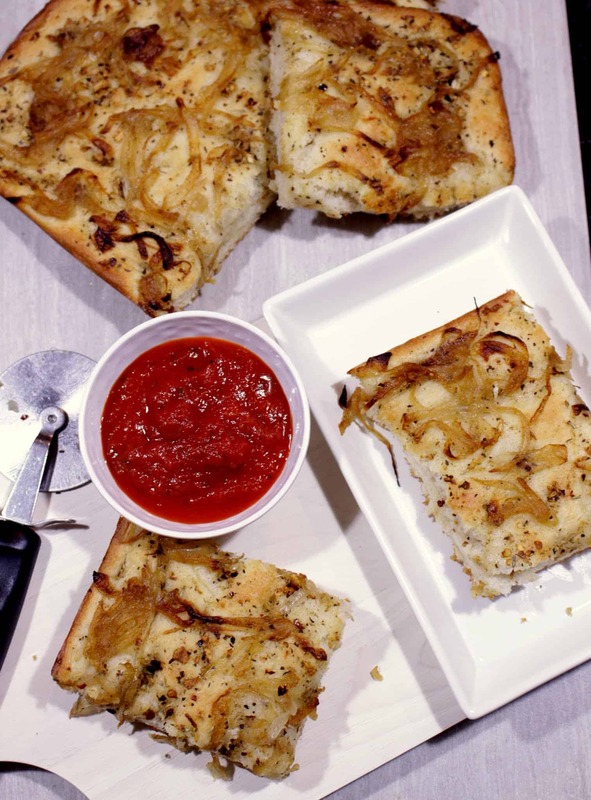 New York style pizza is basically a thin crust pizza which is not too crunchy in spite of being thin crust. 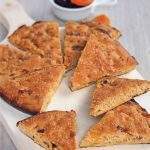 People love to eat the slice by folding it in half, since it is pretty pliable. 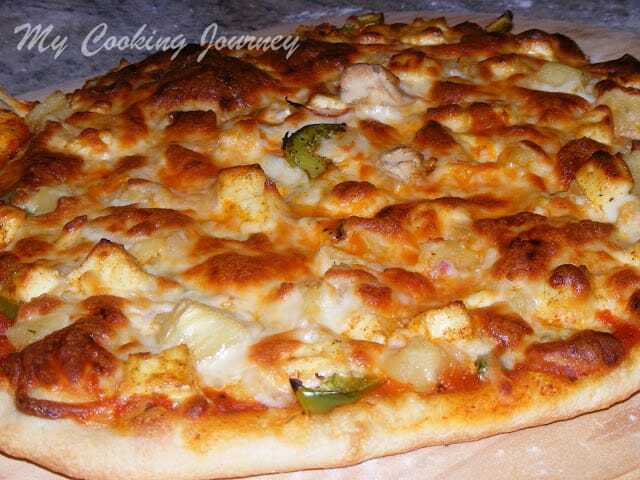 This variety of pizza is quite common in the North East regions of US. This pizza usually is also sold by slice and also as a whole pie. 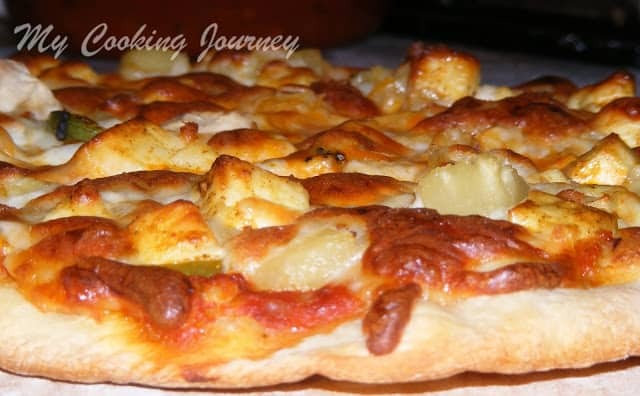 Coming to my experience in making the pizza, it was an absolute hit in my household. 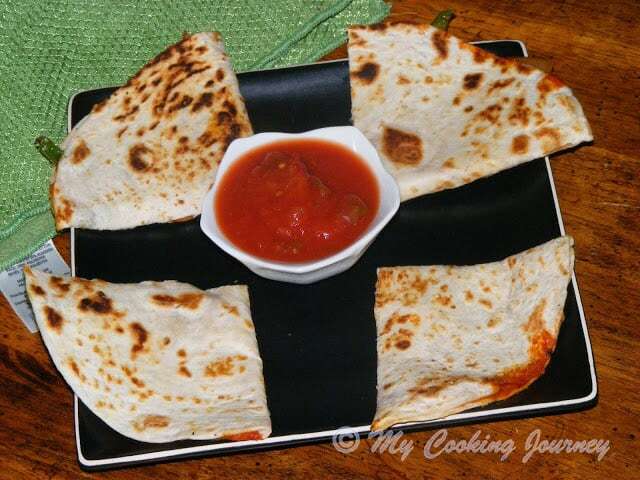 I have a pizza stone as well as an Aluminum pizza plate for baking. I had made 2 pies at the same time to see how the texture differed when baked in the stone versus baking in the Aluminum plate. We noticed that baking in the stone yielded a much crispier crust than in the Aluminum tray. So if you prefer a softer crust I would suggest that you use a metal plate for baking. Also sliding the pizza from the pizza peel to the stone requires some practice; otherwise you would end up messing up the whole oven (Experience is talking here). 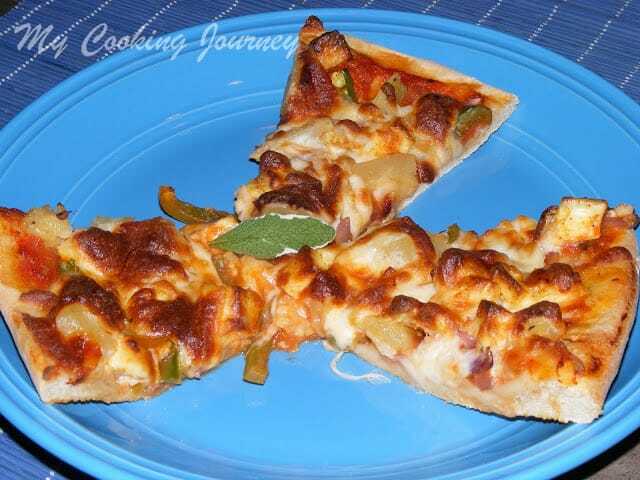 I should also mention here that the pizza tasted great the next day when I reheated them. The process might sound lengthy, but proper planning would enable you to break up the work and make it in phases. 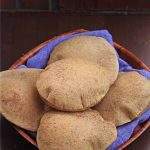 The recipe suggested that the dough can be made up to 5 days in advance and rested in the refrigerator. 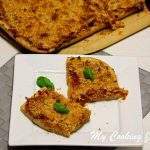 In fact the recipe mentioned that longer it is left in the refrigerator, better the pizza tastes. I left my dough in the refrigerator for about 2 days and it worked perfectly well for me. If using whole peeled tomatoes, pulse the tomatoes in a blender until they are crushed. The puree could be left a little chunky if preferred. I used crushed tomatoes, so I skipped this step. Combine butter and olive oil in a sauce pan and heat it on medium flame until the butter is melted. 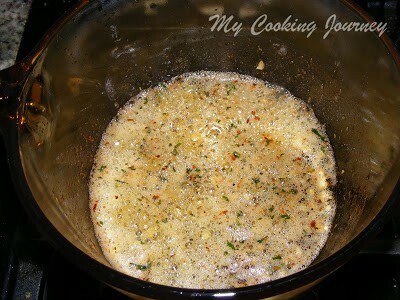 Add the minced garlic, oregano and red pepper flakes and cook until fragrant. 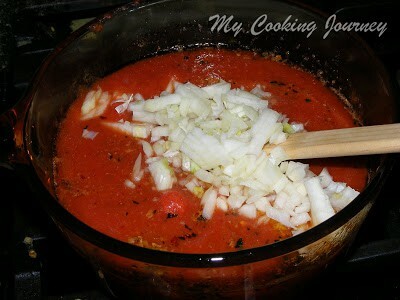 Now add the crushed tomatoes and the chopped onions and mix well. Also add the sprigs of the basil and the sugar. Let it come to boil and then lower the flame to the lowest setting and simmer for about an hour. The sauce would be reduced considerably by the end of the hour. Taste the sauce and adjust the seasoning. I did not add any salt to the sauce since I used canned tomatoes and it had enough salt. 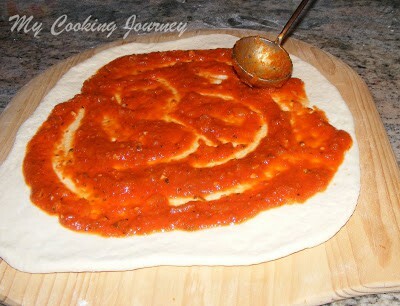 Let the sauce cool down to room temperature and then use it in the pizza. 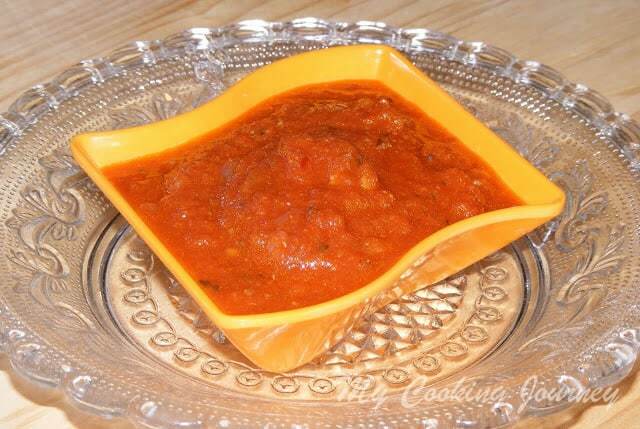 This sauce could be stored in an airtight container for up to 2 weeks in the refrigerator. Combine the flour, sugar and salt in the mixing bowl of the stand mixer. Mix well. 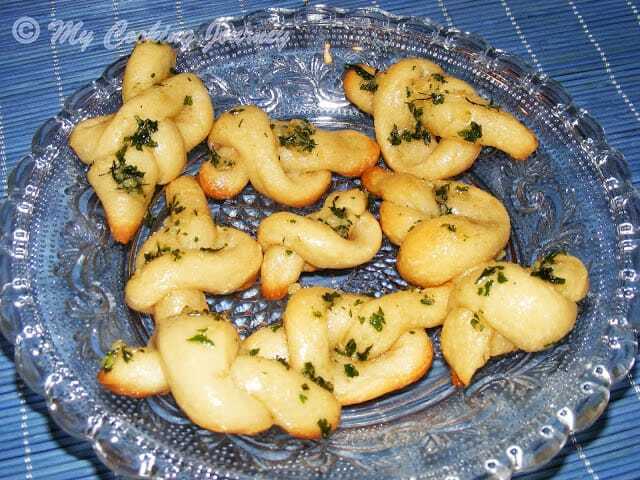 *If using active dry yeast instead of the instant yeast, do not add the yeast to the flour. Proof the yeast in warm water with a tsp of sugar and then add the proofed yeast to the flour. Add olive oil and water to the dry ingredients with the mixer running. 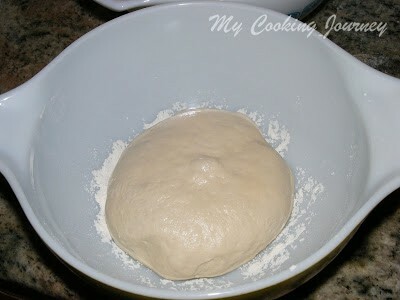 Knead the dough on medium speed until the dough is well elastic and smooth. The dough should pass the window pane test. 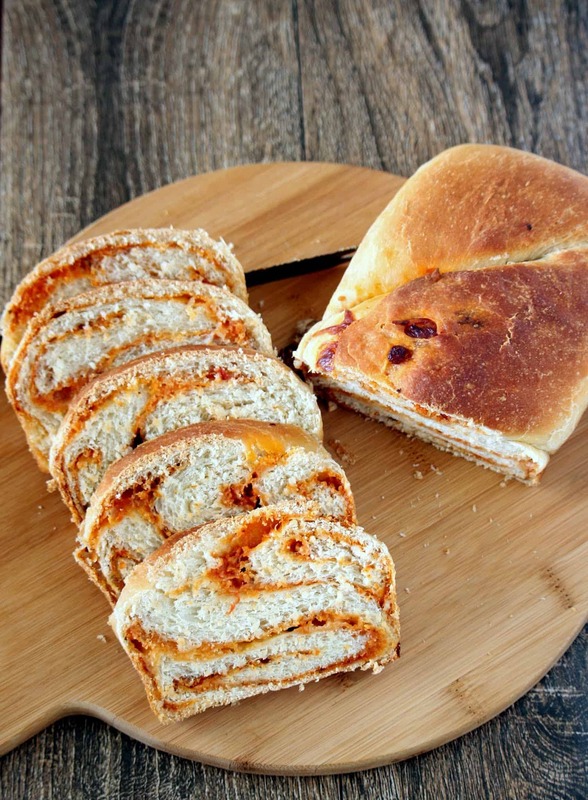 Refer to my this post for detailed explanation of how elastic the dough has to be. I kneaded the dough for about 10 mins on medium speed to get the right consistency. If kneading by hand knead it like we do for chappati for about 10 mins. 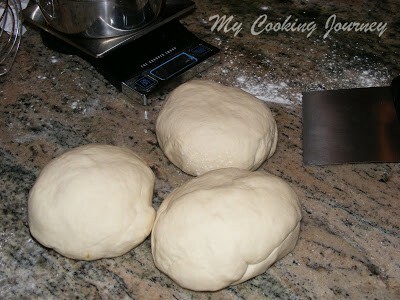 Transfer the kneaded dough ball to lightly floured surface and divide it into 3 equal parts. I weighed the dough to get equal parts. Place each ball in a covered quart size container or a freezer bag and refrigerate for at least a day. You could let it rise for up to five days. I refrigerated the dough for 48hrs. 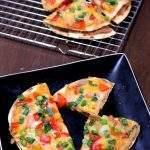 At least two hours before baking the pizza, remove the dough from the refrigerator. Shape it into a ball and place each ball in a well floured mixing bowl. Cover tightly with plastic wrap and allow it to rise at warm room temperature until roughly doubled in volume. If using a pizza stone, preheat the oven with the pizza stone in it to 500F for about an hour. If using aluminum plate, just preheating the oven would be sufficient. Turn a single ball of dough on to a lightly floured surface. Gently press it out to a 8 inch circle, leaving the edges thicker than the middle. 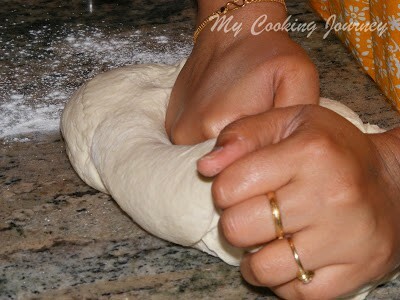 Gently stretch the dough by draping it around your knuckle until it is about 12 -14 inches in diameter and about ¼ inch thick. Transfer this to a pizza pan or a pizza peel in case of using stone. Now spread about 2/3 cup of tomato sauce evenly leaving ½ inch border along the edge. 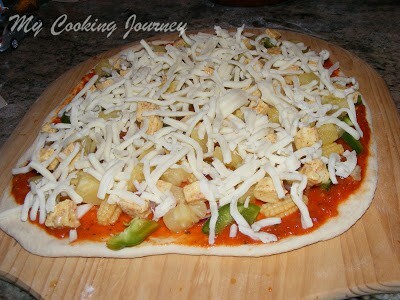 Add the toppings and then spread the cheese evenly over the pizza. Gently transfer the pizza to the preheated pizza stone from the peel. This part could be very tricky. 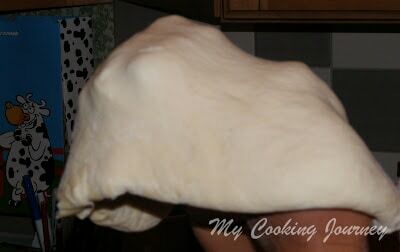 Few things to ensure that the pizza leaves the peel easily are to flour the peel well. 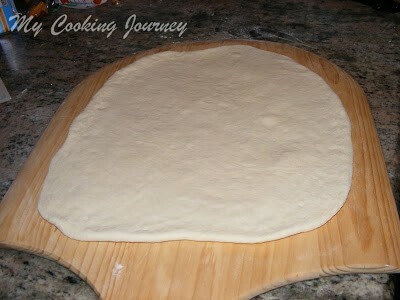 Also assemble the pizza very quickly so that there is not enough time for the dough to stick to the peel. With few gentle back and forth movement, loosen the pizza from the peel and then with few smooth swift movement transfer it to the stone. If using a metal plate, assemble the pizza on the plate. Bake at 500F for 12-15 mins, until cheese is melted and the crust is nice and golden. You will also begin to see the cheese browning up on the top. Transfer the pizza to a cutting board and let it rest for about 5 mins. Then slice it and serve immediately. I made two pies. Once I had the first one in the oven, I started working on my second ball of dough and then assembled it and put it in the oven. By that time it was time for the first one to come out. Wow, you hand tossed it? Very nice. Both your crust and toppings look super. Neat topping choices, it looks very tasty! Wow you tossed it by hand. Grt . 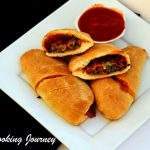 Loved your version with paneer topping. 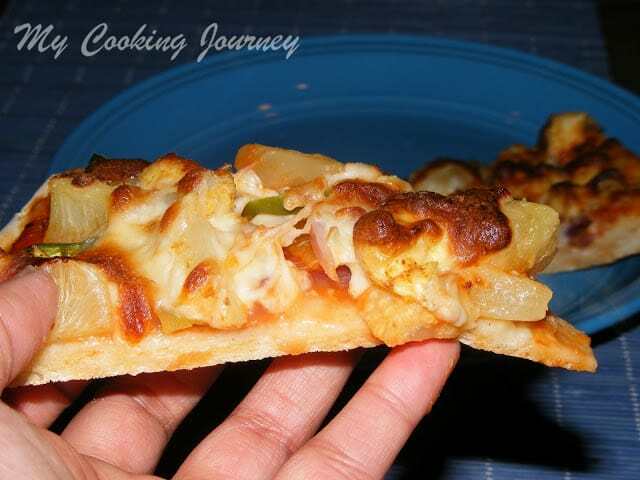 Delicious pizza sandhya you did very well, love that you perfected the hand tossing. 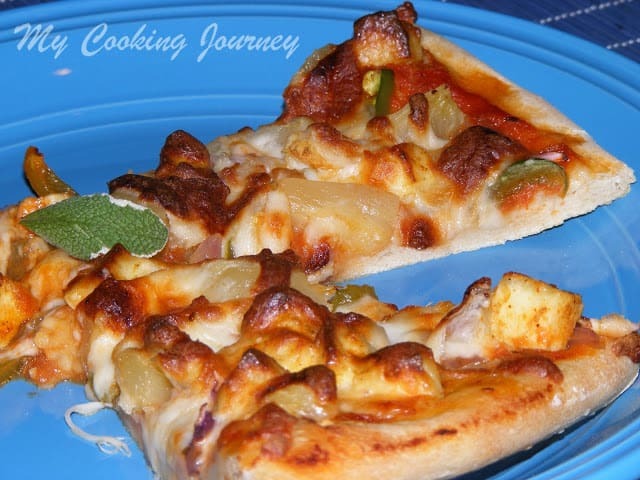 Just luv the look yaar, i like ur browned crust. Pizza has come out very well!! Lovely 🙂 So good clicks :)Amazing step by step wise 🙂 Hope u enjoyed!! !Visit my space once u r free. Wish i get a slice rite now..beautiful crust and droolworthy pizza.